Version 5 of the FORS Standard is now available to download from the FORS website . Organisations with audit dates on and after 14 January 2019 will be audited against version 5 and must therefore prepare their Bronze, Silver or Gold audit(s) against the new and updated requirements. The FORS Standard is revised every two years to ensure it keeps abreast of industry trends and upcoming legislative changes, and to provide guidance for members in their quest to achieve ever-increasing levels of best-practice. The revised FORS Standard now has a broader remit to encompass more vehicle types, including passenger carrying vehicles and powered two-wheelers. Recognising air quality priorities in UK cities, environmental requirements have been revised to ensure that emissions and air quality issues are treated with the same importance as safety issues within the FORS Standard. The revised edition also sets out requirements to help operators mitigate threats of terrorism. To help identify the key changes, Annex 5 of the FORS Standard version 5 provides a comprehensive summary of changes. Section 2 contains important information such as scope of the FORS Standard, terminology, temporary vehicles and drivers, small operators, and an explanation of the new ‘call-out box’ at the end of some of the requirements which is used to show how the demonstration of that requirement links to other supporting requirements. All mandatory training requirements are set out at Annexes 1 and 2 of the FORS Standard for drivers and managers respectively. Annex 1 is split by vehicle type for ease of reference. Both annexes include important information relevant to each type of driver which must be read alongside the training requirements. FORS-approved courses may be used as alternative to a number of FORS Professional training as indicated in Annexes 1 and 2. In order to assist FORS members, a number of transitional provisions are in place – these are identified at Annex 6 of the FORS Standard. To view the FORS Standard version 5, please click here. 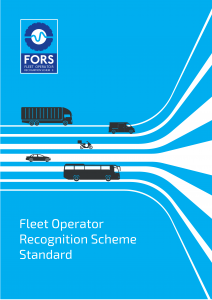 FORS operators accredited against version 5 Silver requirements will meet both TfL (Transport for London) work-related road risk requirements and the requirements of the CLOCS (Construction Logistics and Community Safety) Standard version 3 due to launch in January 2019. For detailed information about the version 5 updates, take advantage of the free FORS Members’ Regional Briefings, located at venues throughout the UK. Book your place here. We are also running special FORS Standard version 5 Going for Bronze and Going for Silver/Gold workshops. To view dates available, click here for Going for Bronze, and here for Going for Silver/Gold. Look out for eNews communications about forthcoming changes to the FORS rules and procedures which will also come into effect from 14 January 2019.